With a top print speed of 55 pages per minute, the HP LaserJet 4350 is, more or less, the fastest desktop monochrome laser printer available. With a range of expansion options including additional paper storage and a duplexor, the printers is the 4350 series are designed for versatility as well as extremely high volume and print speeds. With a maximum monthly duty cycle of 250,000 pages, users will be able to take full advantage of the incredibly fast print speeds that the HP LaserJet 4350 is capable of. Though HP recommends a monthly print volume of only 5,000 to 20,000 pages, the device still offers plenty of leeway for heavy printing demands. The unit’s first page out time of only 8 seconds complements its 55 page per minute print speed as well, allowing for single page print operations to be performed quickly and efficiently as well as enormous document tasks. This is made possible in part by HP’s exclusive Instant On technology that reduces warm up time to zero by way of a special, ceramic fuser. Print quality is admirable for the HP LaserJet 4350, especially when considering the unit’s raw power. While other devices rely on quality enhancement to achieve 1200 dpi resolution, the HP 4350 is capable of true 1200 x 1200 dot per inch printing, meaning black and white imagery, such as charts and graphs, will come out looking clean, and professional. A duplex option is also available to help users create double sided prints automatically. The built in 460 MHz processor is part of the reason that the HP LaserJet 4350 is capable of such fast print speeds, along with the 96 MBs of built in memory. For reduction of slowdown when dealing with complex print operations, additional memory can be added for a potential total of up to 512 MBs. Users who print primarily in text will most likely not need to worry about memory expansion, but once mixed text and graphics come into play, additional memory can be invaluable. Also available is a high performance EIO hard disk. 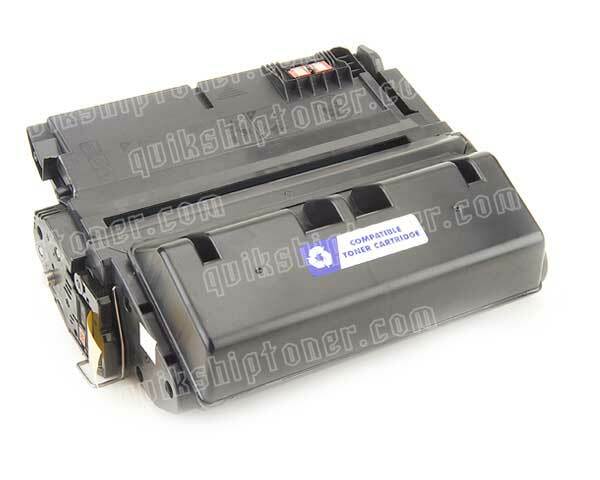 The main downside to the HP LaserJet 4350, and many units like it, is caused by the device’s demands it places on its internal hardware. 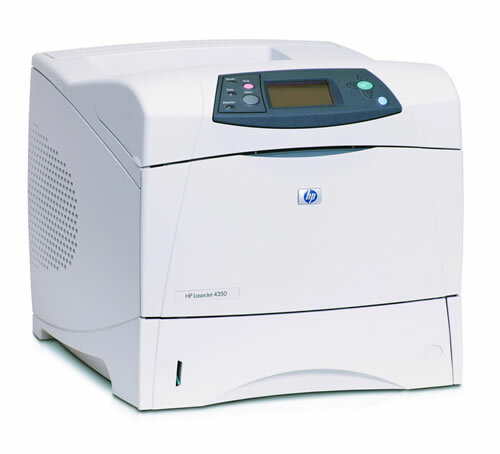 With super high speed laser printers such as this, internal parts are required to operate at extremely high mechanical speeds, and are therefore much more prone to mechanical failure and faulty operation. The 4350 boasts, on paper, some of the most impressive stats in its category, but is known for disruptive malfunctions. 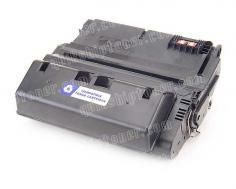 Review it: "HP LaserJet 4350 "
Both high yield and standard toner cartridges are available for the HP LaserJet 4350. With a 10,000 page yield at 5% coverage found in the standard cartridge, the slight boost in price for the 20,000 page high yield cartridge is more than worth considering, as it is a much better overall value. Also available for this device in particular is a 20,000 page yield check printing cartridge that could be handy for the business that requires the printing of an incredible amount of checks at mind blowing speeds.